I led the initial specification and design process for ReadyPath - a tool for educators to plan and track their professional growth. It’s intuitive, easy-to-use and designed to support teachers and leaders without a steep learning curve that takes away from precious classroom time. The modules within ReadyPath follow the professional development process in a logical flow. Plans are created and executed, the results observed, progress charted and mapped against goals. Plans are then updated and identify the critical next steps based on what’s been learned. Unlike professional learning systems that are a collection of disconnected utilities, information in ReadyPath flows among the modules seamlessly. For example, observations automatically update progress status to identify areas in need of improvement, which in turn leads to new goals and actions. Professional development becomes much more streamlined and efficient as a result. A key strength of ReadyPath is its interconnectedness. 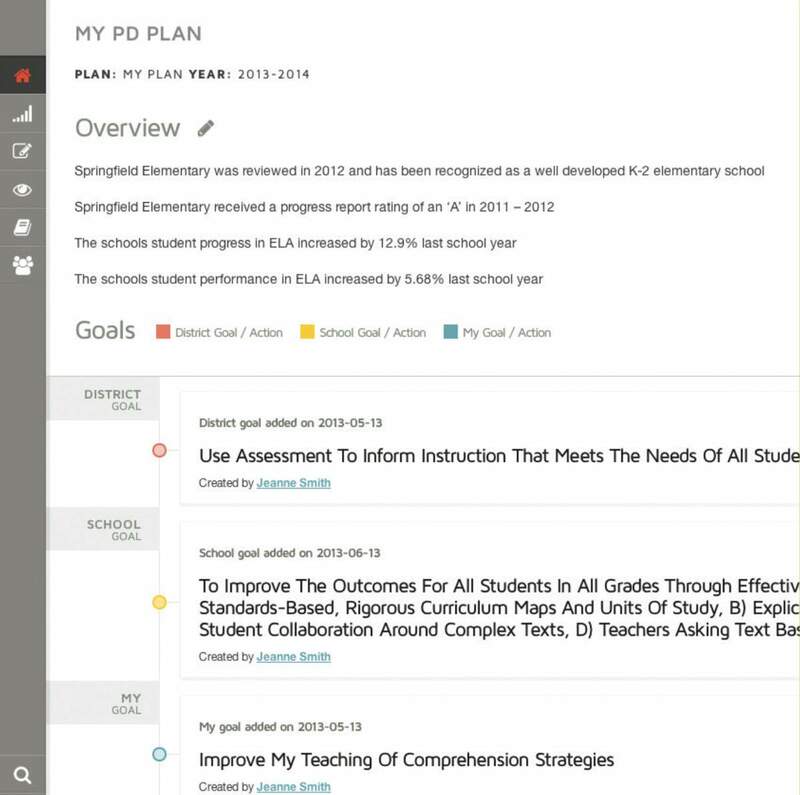 Plans are linked to content, performance is connected to goals and teachers can be grouped together to get a better understanding of overall progress. The system can also integrate with existing district and school systems. My Actions List is like a turn-by-turn navigation system, showing where you are, where you’re going and what you need to do next. It consolidates every activity, showing type, who created it and, if appropriate, links to more resources. For teachers, My Actions List leads step-by-step through their own professional development plan. For leaders, it offers a fully customizable overview of what’s happening and what needs to be done at any time. The ReadyPath Progress module makes tracking the evidence of progress simple through clear data representations that are linked directly to goals and rubric components. 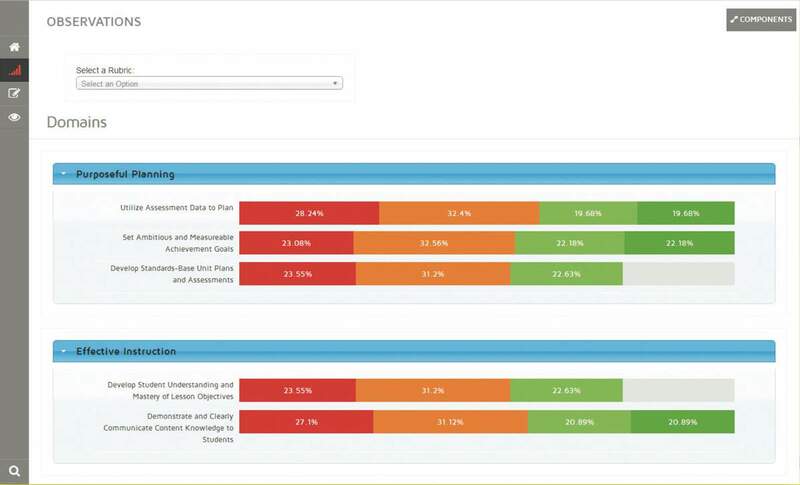 It offers interactive dashboard views of school and district goals, as well as advancement against Generation Ready’s Six Essential Practices and the district’s teacher effectiveness rubric. Administrators can drill down to monitor groups of teachers or individuals, their observations and professional development plans. Meanwhile, teachers can map their own accomplishments against their personal goals to gain an understanding of where they are and the work ahead. Professional development is complex and comes with multiple, often overlapping, goals and actions. There are district, school and individual targets, all of which need to be addressed in an efficient, coordinated way. The Plan module in ReadyPath shows how it all fits together, making planning and follow-through much more manageable. What makes ReadyPath Plan particularly useful is how it links goals, actions and content at every level. District goals and actions cascade down to schools and school goals/actions are passed along to teachers and principals. The final result is a clear composite of everything that needs to be addressed in one place. Goals are color-coded and labeled for clarity, making it easy to see relationships and how broader goals affect individual teacher tasks. Actions in this module automatically appear in My Actions List so teachers and administrators can focus on what needs to be done at any time. Using the Observe module, leaders and teachers can gauge capabilities so that appropriate follow-up activities can be inserted into personal professional development plans. The Observe module is much more than an assessment tool. It makes monitoring dynamic and collaborative by involving the teacher in the process. Every observation is tied directly to the appropriate rubric, which lays out a clear definition of what the rankings mean. This helps clarify expectations, ensure accurate assessment and allows both leader and teacher to provide input. The module also provides private social media tools to encourage further collaboration, enabling teachers to respond to observations and supply evidence of professional growth. Since the technology is designed for use on mobile devices, leaders can make observations any time, anywhere – in one-on-one meetings, in a workshop or the classroom itself. Teachers can also make their own observations as part of self-assessment.